In 1954, Jimmy ran a 5.3, 50yd dash on an indoor dirt track for a University of Delaware record that still stands! It was later tied by Mike Brown, also a Hall of Fame member. Not only a short dash sprinter; he also ran a leg on a University, record setting, mile relay team. 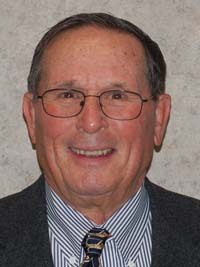 In the fall of 1960 Jimmy was named Head Coach of Track and Field and an assistant Football coach at the University of Delaware. In the Spring of 1961 he took a struggling program and in just two years, turned it into a conference championship team with mostly Delaware H.S. athletes, the first ever for a University of Delaware track and field team. His nineteen-year dual meet won and loss record was 93-28 (76.8%). He coached a number of athletes who still hold University records. He was director of the state High School championship meet for many years and was a tireless promoter of track & field in the state of Delaware. He hosted many college and high school indoor meets and was a strong supporter of the University’s women program and helped support it when it was in its infancy. He coached track & field because it was fun. He had a genuine love for the sport, was highly principled, held very high standards for the conduct of the sport, and would not compromise those standards.